To make a "show piece" of your racks, you can order your wine cellar racks powder coated in a colour to match your decor. Powder Coating is not required to protect most of our racks (as they are made from galvanised steel), but does enhance the look of your racks. 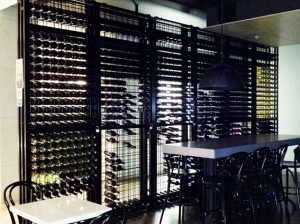 Powder coated wine cellar racks are often used in houses or restaurants where the aesthetics of the racks are considered important. Other Colours are available - pricing is more than listed above (a minimum of $220 more) and can be advised on enquiry. Click below for a selection of powder coating colours for your wine cellar racks.